After the seriousness of my last couple of posts, I hoped to come up with an “uplifting” theme for my latest reflection. And, lo and behold, God provided a perfect picture. My photograph (through a glass door) doesn’t do justice to his living portrait of peace. Still, I thought some of you who recalled my initial post on the brand new fawns that pranced past my office months ago would enjoy seeing how they have grown. When I see such peaceful creatures, I long for the new heaven and earth when the lion shall like down with the lamb. To see the harmony God originally designed—to touch and to taste it—is one of the reasons that Narnia resonates to strongly with many of our souls. In the same essay he elaborates on how the bliss communicated by Nature is only fully experienced by those who look beyond it, to its divine Source. Say your prayers in a garden early, ignoring steadfastly the dew, the birds and the flowers, and you will come away overwhelmed by its freshness and joy; go there in order to be overwhelmed and, after a certain age, nine times out of ten nothing will happen to you. (The Four Loves). I looked out the window today, grateful to God for the majesty of the mountains that grace the horizon. With that prayerful, thankful and receptive heart, I found my expectations in that moment far exceeded . . . swept aside as a trifle in a maelstrom . . . as I gazed upon the purity and peace of our three precious visitors. We saw 4 deer today munching away in our back yard (our azalea bushes get regular trims : ). 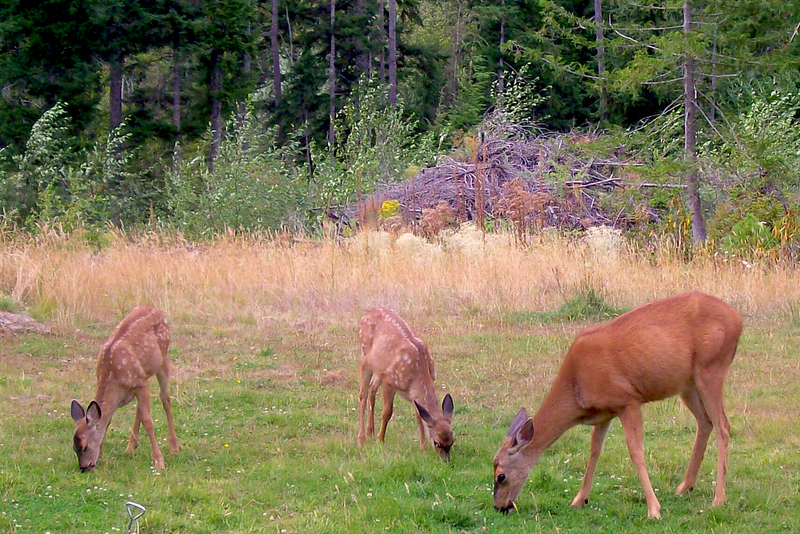 … Seeing 2 Bambi-ish little ones made us smile & thank our Creator for the perk of the day! Glad I live in the country. Seeing the wildlife serves as a daily reminder of God. We’re blessed to frequently see deer, wild turkeys, and squirrels often. Scenes like this make you feel that sometimes things are all right with the world…maybe we just get bogged down and don’t see all the good around. Nothing like a glimpse to encourage and remind us? That is very wise, I think. Nice entry…but I’m in hyper-excited mode over your user name. Does “MereInkling” reflect “THE INKLINGS”????!!!!! As in Lewis and Tolkien and Co? If so….Dude, where have you been? Yep, Mere Inkling alludes to the Inklings, and in a secondary manner to Lewis’ work, Mere Christianity. Standing in the shadow of the masters, I believe we too can press forward in their spirit. That’s why faith and history, along with writing, are the blended themes that flow together through this blog. I hope you enjoyed your visit and join us regularly in the future. I got a bit over obsessed with Lewis for a bit…in an unhealthy way. So I had to back off and remind myself that he too was human. That said, I’ve never actually met another person who nerds out over The Inklings. Excitement abounds. I am trying to remember a passage where Lewis describes the sensation of walking into a forest glade in which one suddenly has the sensation, hair rising on the back of the neck, that one has just missed something, something from beyond, something glorious. One looks about and if they were awake a moment before, the trees are once again fast asleep. They do not know or acknowledge one as they might have but a moment before. Lewis then wonders what “new creation” will really be like when one enters such a glade and the glory is not missed, when the beech and the rowan truly know one and greet one by name? I say, Amen! I am sure the new heaven will be quite fine in a heavenly sort of way. I, however, can be brought to tears at the thought of what it will be like to have the trees of the new earth as my friends and to have a Lark fearlessly perch on my shoulder and sing my name and to then sing her name back to her! I shall never get tired of the new earth when I shall cease to be strange to God’s good creation and it to me. Lewis taught me this but I cannot now remember where? Was it in the Weight of Glory? I should read that again… too many years.